Chris is a Solicitor in our Litigation & Dispute Resolution Team. He provides assistance with a wide range of commercial disputes and will qualify into the team in September 2018. 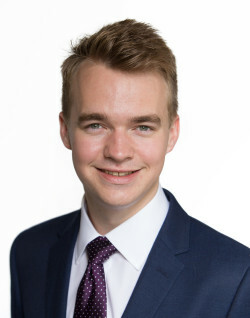 Chris graduated from the University of East Anglia with a first class law degree in 2015 before completing his Legal Practice Course at BPP in Cambridge in 2016. Chris joined Leathes Prior as a Trainee Solicitor in September 2016. Chris started his training contract in the Corporate and Commercial Team before spending time in Litigation & Dispute Resolution and Employment. In March 2018, Chris returned to the Litigation & Dispute Resolution Team where he qualified as a Solicitor in September 2018. During his training, Chris has gained experience of a broad range of contentious and non-contentious commercial work, including commercial contract disputes, drafting and enforcing restrictive covenants in employment contracts and intellectual property infringement. Chris has also assisted on a number of sports law matters, and continues to have a keen interest in this area. Chris is an active member of the tech community in Norwich and recently took part in Sync the City, a 54-hour business start-up event. Chris was a part of the team behind ‘Unwind’, an app to help those suffering with stress and anxiety, which won the People’s Choice Award. You can watch the final pitch for Unwind here. Away from the office, Chris is a budding runner and since joining the firm he has taken part in and organised the firm’s team entry to the City of Norwich Half Marathon. Chris is a Norwich City fan, and in his spare time he enjoys playing badminton and football.